First, acquire supplies. The veneer will be the hardest to find since it is not usually found in craft stores. I recommend looking for sample lots on Ebay – Even though most wood supply stores will have some form of veneer, they usually offer low-quality goods. On Ebay, I have been able to find small samples of unique and beautiful woods. You could also look around for online distributors or at a good-quality furniture refinisher in your area. All you need is approximately one square foot of each type of wood, so if you find the right source this is a minimum sample size and should be dirt cheap. 1)	Wood veneer. Get at least four different kinds. Veneer is a tricky thing and all number of factors could affect performance – The wood could be too old and dry, warped, too thick, too thin, or have too much figure and will refuse to take a cut without shattering. Getting multiple kinds will increase the chances that you can get started on the project immediately. If you can find them, get pearwoods and cherry (soft woods and very easy to cut) and stay away from dark walnut (hard and splinters when cut). 10)	Greenstuff. Lots of it. 12)	Sandpaper. One sheet of 220 and one sheet of 600 or higher grit. Before you select the veneer, take small samples from each and dip them in water. This is important, for when the wood is finished and oiled there will be an intense color shift. The basic color tone for almost all woods is either red or yellow, but it is difficult to tell the tone simply by looking at the dried wood. It’s possible that the woods selected might clash when oiled, so get the samples wet, lay them on a neutral background, and see which two colors look best together. 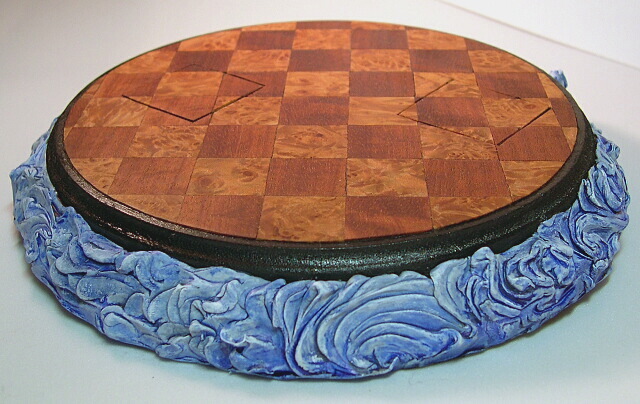 I used a quilted makore and a golden maple burl, and although it was a “golden” maple its base color is red. The next step is the platform. I made mine by taking two unfinished wooden trophy plaques of different sizes and bonded them together with the J.B. Weld to get a “leveled” tier effect to use as the foundation for the waves. If you do bond multiple platforms, be generous with the bonding compound, center the platforms, and pile some books on top to make the bond set evenly. Once the bonding compound has set (Give it a full 24 hours. . . It’s worth it just to avoid having that oh-so-unique sensation of the chisel digging straight through your hand as the bottom platform shoots across the room like a rocket), you will start laying the gridwork. 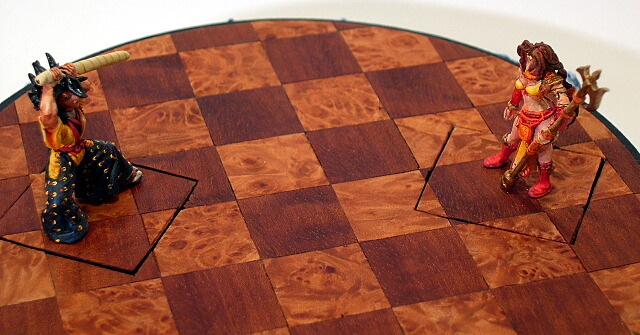 On the top of the platform, decide how large you want the veneer tiles to be and draw a checkerboard pattern. It is important to be exact in measurements at this point: I use a narrow metal ruler slightly wider than a centimeter and simply draw down each side to make sure that the lines are parallel. Next, ON TOP OF the grid that you have already laid down, take two of the wooden squares. Position the squares where you want to see them in the final project as this will be where you want your miniatures to stand and mark where they are in the opposite color pen. 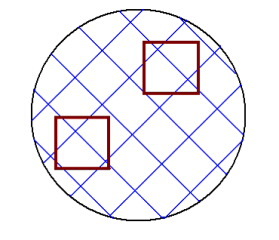 Keep in mind that these two squares do not have to be parallel to the existing gridlines, but if they are it minimizes the cutting and fitting of the veneer at a later point. Once the gridwork is down, take the paint and go around the outside edge of the gridwork. Cut in no more than a quarter of an inch into the gridwork, but go down the edges as much as you want. Most of the painted areas will be covered up with veneer and greenstuff, but this is necessary as a background layer for the later work. Now comes the hardest part of the project. Take the X-Acto and carefully cut along the edges you have drawn for the squares. You want to bring the blade deeply enough to cut slightly LESS than the depth of the square when it is laying flat. Then take out the chisel, say a silent prayer, and start digging. If you were careful in your cutwork, the chisel should stop at the wall you created with the X-Acto knife and you can remove wood shavings without carving into the surrounding areas of the platform. Go with the grain and keep going gradually deeper with each progressive layer. Go slowly and expect this to take some time, but when you are finished the hole you have carved should already be perfectly square and the bottom flat without additional sanding. If possible, try to avoid sanding these areas, as they will be painted later and it is impossible to clean all the dust out of the corners. Resist the temptation to go poking around with the X-Acto unless you are wearing goggles, as the blade will break. Now see if you can fit the squares into the holes you have carved. What has probably happened is that the chisel work took out the excess depth and the square now fits in the hole with its surface flush (or close enough for horseshoes) with that of the platform. If not, take the square out of the hole and put it flat on a piece of sandpaper, and grind away at it. Keep checking to see if the square is flush, but dust it off before it goes back in the hole to keep the corners clean. TIP – If the square doesn’t fit in the hole you have made (e.g. : too big or too small), try another square. Mine came in a bag of about 25, and even though the sizes are approximate, there were squares that fit better than others. Once the holes are carved and the squares selected, paint the squares and the holes. Set the squares aside and break out the veneer and the Superglue. You’d never use Superglue on real veneer work since wood breathes and moves around with environment change, but for a down-and-dirty job like this it’s perfect. Take the X-Acto knife and cut your first veneer tile. Remember to keep refreshing your blade whenever the veneer begins to flake and pull apart, instead of taking a straight cut. Start applying tiles from the MIDDLE of the platform – You will be fitting the veneer to the piece, not the other way around, and if you work from the edge towards the center it will only throw off the balance. Make one core block of four tiles grouped together in the center, and then gradually build outward. Use the grid as the guideline to keep the transitions even, and frequently take the metal ruler and place it against the sides of the finished tile. If you are working carefully, the edge of the tile should line up perfectly on the side of the ruler. There will be times where the veneer and the grid will overlap the holes that you cut for the square miniature platforms. When this happens, DO NOT glue down the tile that overlaps until it has been successfully cut to fit along the edge of the hole as well as lying flush with the other tiles – You will probably be cutting multiple veneer pieces for this part until it fits correctly. As you can see in the following image, veneer has a lot of character and it’s easy to tell just by quickly eyeballing the wood grain that the same piece is cut in half. When you do make a good fit, the two sides are then glued down to the platform and the square. From above, this should look like the standard veneer tile with a line bisecting it: Don’t make the fit too tight or the veneer could break when the miniature and its platform are removed from the base. When the veneer tiling is finished, the circular outside edge of the veneer will need to be trimmed up. I have not found a better way to do this than careful freehand with an X-Acto, but it’s a slow process and there are too many ways to screw up to suit me. Bring the cut in slightly away from the outermost edge of the platform and use it as the guideline, then run the cut all the way around the edge. The end result should be an even edgework that shows the paint you already laid down. The paint might need some touchups thanks to the glue, but if you are using an enamel this is not a problem. Leave the wood veneer alone for now and move on to the textured greenstuff on the lower part of the base. I used waves on mine, but any type of surface (e.g. : rocks, a stone wall, meadows) will do. Get this part finished and painted FIRST, before putting the finish on the veneer. This allows for any stray greenstuff or paint to be sanded off before the finishing oil is applied. Once the greenstuff is finished, you can apply a coat of dullcoat if you choose. Now take the 220-grit paper and sand the veneer. You have to take care not to attack the wood, as there are a lot of “hidden” corners that are vulnerable around the edges of the squares, and it would be maddening to have to cut new pieces at this late in the process if one of the existing ones shattered or splintered. Veneer is pretty smooth to begin with, so sanding is a light job. However, if you applied dullcoat you MUST remove all of this from the veneer or it will not accept the oil. After the surface won’t take any more sanding with the 220-grit, move up to the 600 grit. The final finish will be almost as smooth as glass. Apply a light coat of oil, wait a half-hour for it to sink in, and apply a final coat of oil. If you’ve done an incredible job with the finish work, you might need to scrape up a tiny surface on the squares in order to get the glue to affix to your miniatures.